This page was created to assist first time and frequent customers quickly answer some of the usual questions that we receive regarding our products and services. We have chosen not to place our prices on our website at this time. For pricing information, please call, fax or e-mail us at the numbers listed at the bottom of this page. Payment can be made via credit card (Visa and Mastercard), cheque, money order or direct bank transfer. For bank transfer details (account and routing numbers), please contact us. Can your radio transmitters be refurbished? Provided they have not sustained irreparable damage or internal component failures, all of the radio transmitters we manufacture (including our smallest units) have the potential to be refurbished. Please contact us regarding prices for this service. How do I activate/de-activate my transmitters? LB-2X, LB-2XC, LB-2N and LB-2 – The LB-2X, LB-2XC, LB-2N and LB-2 are activated by soldering two wires together. For soldering instructions please click here. All other transmitters – All of our transmitters are activated/de-activated through the use of an external magnet. Removing this magnet activates the unit (note: this may take up to 3 seconds), replacing it de-activates the unit. When de-activating these units for storage, please ensure that the unit is off AFTER you have secured the magnet to the transmitter, since the magnet may move slightly while being secured. What kind of range do your transmitters produce? In general, range is difficult to estimate as each person’s study area is unique. However, the main factors that affect the reception range of radio transmitters are terrain and vegetation. Areas with little or no hills will allow for good signal propagation, whereas hilly or mountainous areas will reduce the transmission range considerably. The same holds true for vegetation, with areas of lush vegetation hampering range more so than sparsely vegetated ones. For range estimates on our various transmitter models, please e-mail us. How do I verify that my transmitters are off upon delivery? On the packing list that is included with our transmitters, we have included a note that reads: “On receipt of transmitters with magnetic switches, please verify that the transmitters are turned off”. This is particularly important for our shorter lived BD-2X, BD-2N & BD-2 transmitters whose batteries exhaust themselves in a short period of time once activated. If you have your receiver, checking these units is quite easy. Simply dial in the frequencies, one at a time, on the list provided and if you hear any pulsing, the magnet has been moved during transport. At this point you will need to adjust the magnet on that unit until the pulsing stops. If you do not have your receiver handy, you can check the units by dialing a normal FM radio off station, somewhere between 100 – 108MHz. Hold all your transmitters up to the antenna while listening for a change in background static. If you hear fluctuations in the static at regular intervals this may indicate a transmitter is on. Unfortunately, there is no simple way to tell exactly which unit is operating, so you will have to check each unit until the pulsing stops. How should my transmitters be stored if I don’t plan on using them right away? All batteries will naturally drain their energy over a period of time, even when not being used. The batteries that we use for our transmitters are no different. If you are not planning to use your transmitters for some time after receipt, we recommend that you store them in their original package in a cool, dry place (such as a refrigerator). This will keep the natural drain to a minimum. For our smaller BD-2N and BD-2 units, we do not recommend storage for more than 1-2 months prior to use. How should I attach my transmitters? Attachment instructions for the AI-2C transmitter can be found here. Attachment instructions for the LB-2XC, BD-2XC, BD-2NC, BD-2C, PD-2C and RI-2D transmitters can be found here. For information on gluing techniques and recommended types, please click here. How do I read my temperature graphs? Each temperature sensitive transmitter that we manufacture is supplied with a plotted graph (see diagram below). This graph allows the user to determine the temperature of the transmitter (and therefore the animal, if implanted) it is being used with. 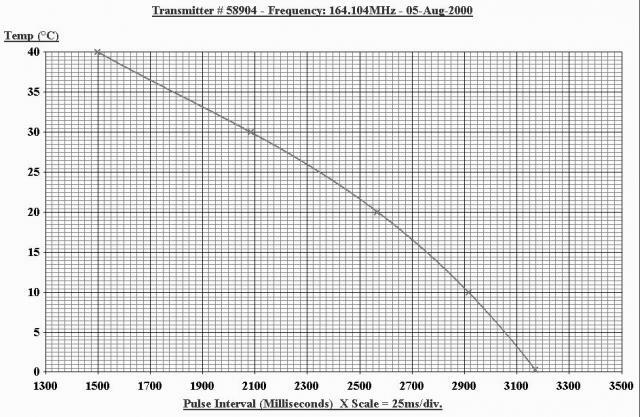 The graph indicates the temperature of the transmitter based on the interval between pulses (ie. the smaller the interval, the higher the temperature; the larger the interval, the lower the temperature). The easiest way to calculate the pulse interval is to count 11 pulses (this will give you a total of 10 intervals) while using a stopwatch to measure the total time this takes. You then divide the time by 10. The answer will be your pulse interval (1 second = 1000 milliseconds) and you can then determine the temperature on the graph. If you were unable to find the question/answer you were looking for, please do not hesitate to contact us. If we feel your question may be of use to other visitors to this site, we will post it along with our answer.